Root Block Root Deflectors are continuous rolls of high density polyethylene root barrier material available in custom depths from 6 inches to 48 inches. The depth of root barrier use depends on the site: available space, soil, and the new and existing trees. 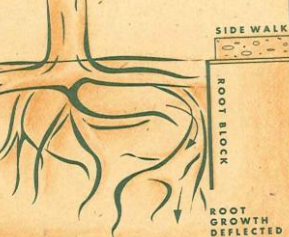 Root barriers should be used to deflect root growth following root pruning. Healthy trees require growing roots. We do not want to stop root growth, just control it. Tree roots will not magically grow downward once severed. Our experience shows they will grow right back into the area where they were growing, emanating from the cut root ends. Deflecting these new generating roots will allow the tree to continue to grow while protecting the improvements to our property. New site designs and retrofit construction can protect infrastructure by directing root growth. Placing linear root barriers adjacent to the infrastructure improvements has been proven to reduce root conflicts. Root Block Root Deflectors have been in service since 1986. No roots have grown through un-damaged material. Roots may grow under, over, or around a barrier. This should be considered in determining barrier length, depth, and follow-up maintenance.